Slippery Elm bark was used both internally and externally by Native Americans and early pioneer settlers. Today, the inner bark is used for its soothing and emollient effects. Nature's Way Slippery Elm bark is harvested from wild trees with a careful stripping process that does not hinder the tree's growth. Directions: Adults: Take two twice per day with warm water between meals. Warning: Consult a health care practitioner before use if you are pregnant or breastfeeding. 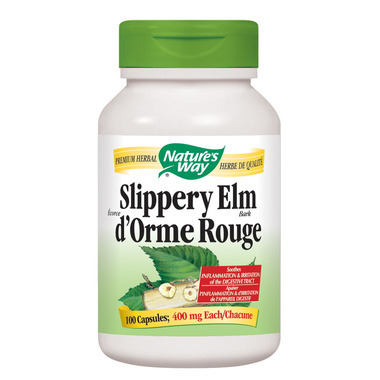 Slippery Elm should not be taken in conjunction with medications as it may interfere with their absorption. Do not use if you have an intestinal obstruction. Quite helpful for constipation. I take it with me everywhere I travel. Using it for 2 weeks for my IBS symptoms, but so far the effect is not appreciable.